Potomac, MD (Jan. 21, 2016) – MobyMax, innovator of personalized and blended learning curriculum for K-8 students, is helping Aldeane Comito Ries Elementary School in southwest Las Vegas reach its goal of establishing innovative, blended learning for all students. “MobyMax sets up personal learning paths for each student and helps them fill any gaps that might be missing,” said Janice Heffernan, a blended learning strategist for the school. According to Heffernan, a few years ago, the administration decided to take the school in a different direction to address the learning needs of all students. After purchasing mobile devices for every student, the district embarked on using the free MobyMax tool that covers reading, writing, math and science for grades K-8 to incorporate blended learning into the classroom. A growing practice in classrooms nationwide, blended learning combines traditional face-to-face educational opportunities with learning through digital and/or online media, usually with an element of student control over time, place or pace of learning. According to the Center for Educational Reform, the efforts toward improving education in the U.S. include a strong focus on online and blended learning and are emerging as the predominant education model of the future. With the right tools in place to establish blended learning at Ries Elementary School, Heffernan said that students are taking charge of their own learning and are indeed learning at an accelerated pace. Heffernan said that the teachers and students at Ries Elementary School alike are thrilled with what MobyMax offers them for blended learning opportunities. “Their feedback was the reason we went ahead and purchased a license for the following school year,” said Heffernan. To learn more about the school’s use of MobyMax, download the MobyMax Spotlight – Aldeane Comito Ries Elementary School. For more information about MobyMax, visit www.mobymax.com. MobyMax unlocks the power of personalized and blended learning to help students learn twice as fast. The company offers the only complete K-8 curriculum covering English language arts, math, and science. 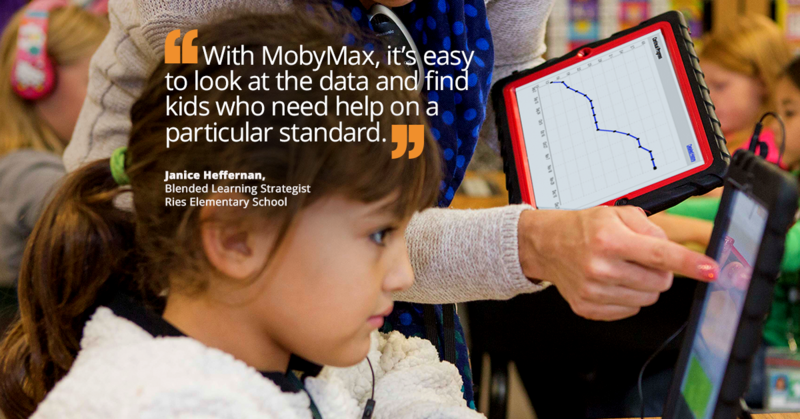 MobyMax identifies skill gaps with find-and-fix technology that targets instruction and helps students increase one full grade level in just 40 hours. Moby’s comprehensive system includes multiple motivation tools, test prep, assessments, messaging, parent portal, classroom clicker, and progress monitoring. MobyMax is used in more than half of all K-8 schools in the United States and has more than 15 million students registered. For more information, visit www.mobymax.com.